Last week the kids and I spent over 30 minutes laughing and giggling as 6 butterflies danced around our heads. I have never been this close to butterflies in the wild, especially this many! They would land on the fence, dance two by two in the sky above us, fly over our heads and then land back on the fence. They allowed us to get quite close and we were able to study them for quite a while. It was an absolutely magical experience! My kids are a bit timid when it comes to most insects, but this year they are warming up to them. I watched my two year old daughter follow an ant around the driveway the other day, stopping when it stopped and then stooping down for a closer look. My son loves his bug box that his buddy made for him and had a centipede in there a few weeks ago with lots to eat 🙂 Insects are something in nature that are available to everyone and you need not spend any money to spend time with them 🙂 Whether you are watching an ant hole, observing honeybees (from a far is best), watching dragonflies and butterflies dance across the sky or trying to identify a new kind of bug…there is so much to explore. Here are some great books to help bring an appreciation to the world of insects. 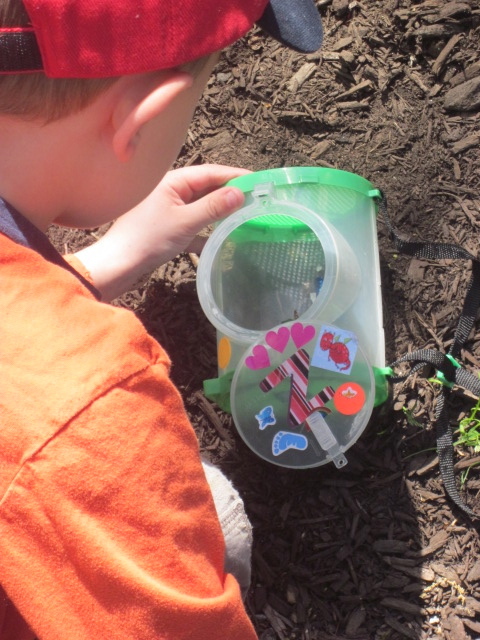 Give your child a clear container with holes and a magnify glass and they can spend hours searching in your backyard or local park. If you have some other good books to share, please do so in the comments! We are always searching for new books to read.